The ranking of the Muslim Rumi as America's best-selling poet is, like the embrace of vinyl by a hard-core digital culture, one of the paradoxes of recent times. Rumi's inclusive message of joy and love explains his universal but still surprising appeal, and in populist interpretations by Coleman Barks and others this message resounds in verses such as "I am neither Christian nor Jew, neither Zoroastrian nor Muslim, I am not from east or west" and "I am a drunkard from another kind of tavern. I dance to a silent tune. I am the symphony of stars". Rumi's life-affirming poetry has been set to music by notable figures including Philip Glass, John Tavener, Jonathan Harvey, R. Murray Schafer and Karol Szymanowski, while takes on Rumi by rock musicians have included the 1996 album Three Fish by the eponymous band led by Pearl Jam's Jeff Ament. All of these settings of Sufi poetry use translations of varying accuracy of Rumi's original verses. 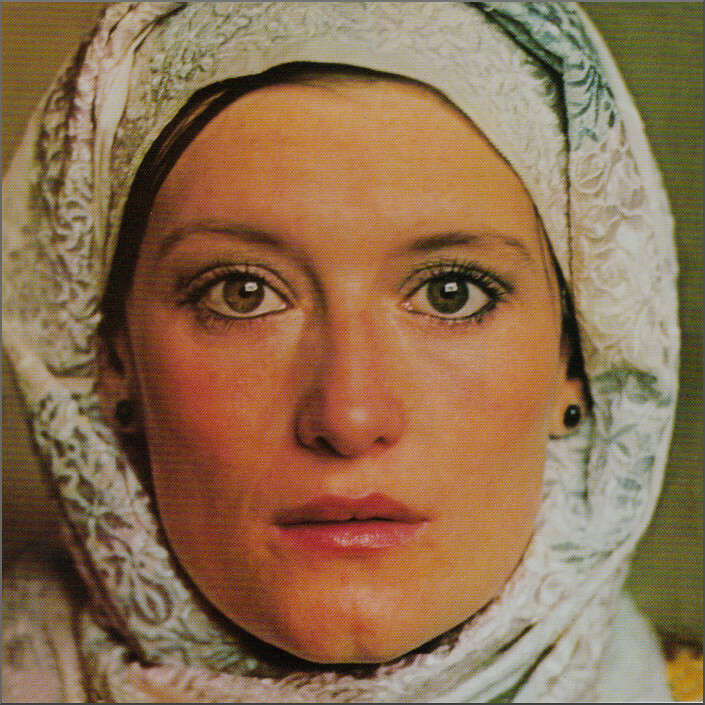 But the folk rock album seen in my header and footer images is unique because the lyrics of the Sufism-imbued Pour Down Like Silver are contemporary creations. "By the time I was 20, I had worked my way through Watkins bookshop in Cecil Court [in central London], from A is for anthroposophy to Z is for Zen. In all that, I thought the Sufis [the "mystical poets" of Islam] had the right balance and the right connection. And at exactly the moment I arrived at that thought I saw there was a Sufi meeting two minutes from our house in Hampstead, at a church hall in Belsize Park. So I went down there and I'm looking round this circle of invocation and I realised I knew four of them, all musicians I had done session work with. And then there were all these gorgeous women and great food. So it seemed right..."
The Sufi group was led by Abdalqadir as-Sufi. Born Ian Dallas in Scotland in 1930, he was part of the London media scene in the 1960s where his work included adapting classic novels for the BBC and appearing in Federico Fellini's iconic 8½. In 1967 Dallas converted to Islam in Morocco and took the name Abdalqadir as-Sufi; he joined the Darqawi Sufi order in Morocco before eventually returning to London. In 1972 Abdalqadir established a Darqawi community modelled on a traditional Moroccan zawiya [Sufi lodge] in the Bristol Gardens area of Little Venice, and Richard Thompson and his wife Linda were among the first members. Efforts by the Sufi adepts to emulate a Moroccan zawiya extended to wearing jellabas, the scatchy Moroccan garb immortalised in Graham Nash's Marrakesh Express. 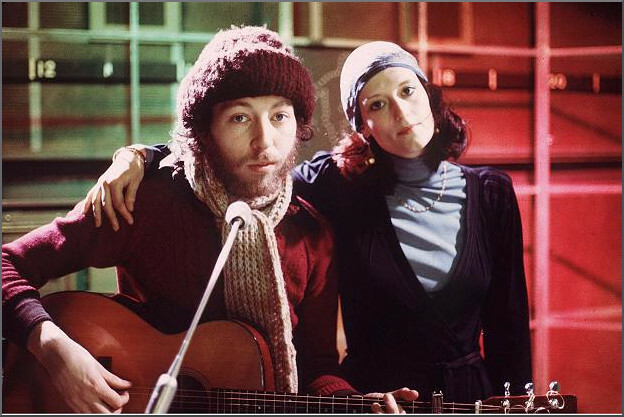 Richard and Linda Thomson - seen above - recorded Pour Down Like Silver in 1975. They were signed to Island, and the album was recorded by John Wood at his Sound Techniques studio in Chelsea, London, where other great Island productions including Nick Drakes' three legendary albums had been committed to tape. Among the backing musicians were Fairport Convention's longest serving member bass guitarist Dave Pegg. The lyrics for Pour Down Like Silver follow the Sufi tradition of allegory established by Rumi, with references to wine, love and intoxication being open to either profane or spiritual interpretation, as in the title track - 'O the songs/Pour down like silver/They can only/Only break my heart/Drink the wine/ The wine of lovers/ Lovers tired of being apart'. The metaphysical sub-agenda of the album was reflected in the album artwork with Richard Thompson wearing an album and Linda hijab. These striking images which top and tail this article were the work of Peter Sanders who photographed many rock celebrities including Dylan, Hendrix, The Doors, The Who, and the Rolling Stones, and who like Richard Thomson converted to Islam and took the name Abd al-Adheem. But in a year that saw the release of Pink Floyd's Wish You Were Here, Dylan's Blood on the Tracks, Springsteen's Born to Run and Queen's A Night at the Opera an album with coded lyrics about ecstatic mysticism never stood a chance, and Pour Down Like Silver made no impact at all on the all-important charts. But subsequent critical reaction to this thoughtful essay in contemporary Sufism* has been kinder, with one critic describing it as "one of the most quietly remarkable albums Thompson or anyone ever made". 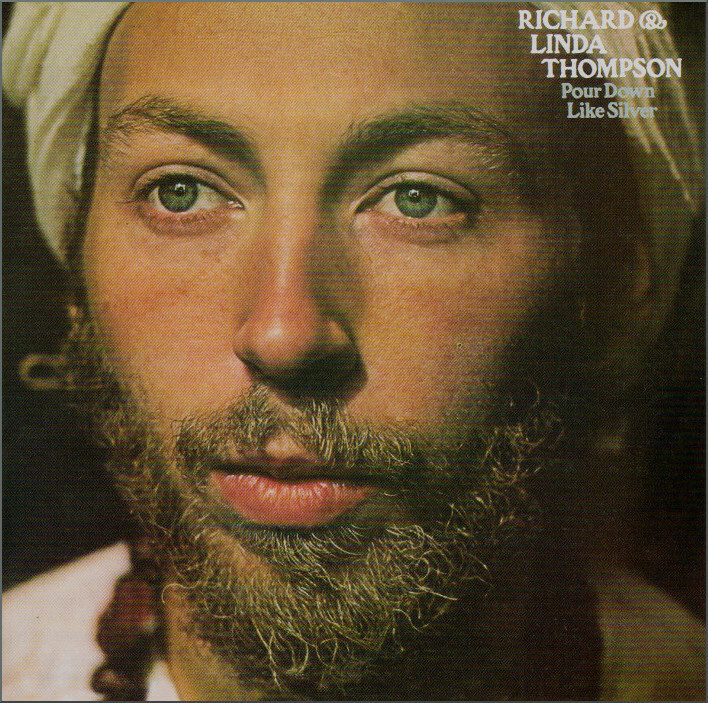 Pour Down Like Silver was the last album Richard and Linda Thompson released before beginning a self-imposed three-year spiritual sabbatical. In 1976 Abdalqadir and the Darqawis abandoned London and moved to the imposing Wood Dalling Hall and adjacent farm in north Norfolk not far from where this post is being written. At its peak the Wood Dalling community was home to around two hundred Sufi families, supported by financial contributions from the Muslim community. But the dream was better than the reality, and the ideals of Moroccan dress and home schooling were gradually abandoned for more practical solutions. Bit by bit the rural zawiya disintegrated, with some of the stalwarts led by Abdalqadir exchanging rural Norfolk for urban Norfolk, and in 1977 they purchased a disused school in the city centre with funds from a charitable foundation and converted it into the Ihsan Mosque which still functions today as a Muslim place of worship. The influx of Sufi adepts created a Sufi community in Norwich which continued into the 21st century, with more than 100 darquis living in the city including Rufus Bewley (Abd al-Haqq) who had accompanied Abdalqadir as-Sufi on his life-changing first visit to Morocco. Abdalqadir went on to start the Murabitun World Movement, a grouping which although espousing liberal views - terrorism (against), veiling (against) and social welfare (for) - caused considerable controversy by its alignment with the orthodox and provocative Salafi movement. Through all this the connection between the Darquis and music continued, and in 1990 Abdalqadir writing as Ian Dallas published the erudite and thought-provoking The New Wagnerian which reinterprets Parsifal as a paen to Islam, prompting me to ask in 2013 Are we ready for an Islamic interpretation of Wagner? Richard and Linda Thompson divorced in 1982. Since 2000 Richard has been based in Santa Monica, California. He has maintained his Muslim faith, but now wears it a little more lightly. In a 2010 interview he explained: "I suppose I keep my head down a bit more. It is important to assert your belief obviously. But [America] has a lot of ignorant people in it." I wonder what his views about this are today? * Island Records, which was acquired by Polygram/Universal Music in 1989, has done a commendable job of keeping its distinguished back catalogue available in CD Format; Pour Down Like Silver is available with original artwork and bonus tracks. No review samples used. Any copyrighted material is included as "fair use" for critical analysis only, and will be removed at the request of copyright owner(s). Also on Facebook and Twitter.